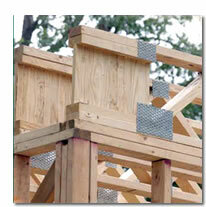 We offer an alternative to custom wood floor trusses with a trimmable end truss. Available in 4'-26' lengths, trim end trusses have all the advantages of a traditional webbed truss but with quicker turnaround. With a full 12" of trimmable material it eliminates errors on the job site associated with dimension changes.